With that in mind, I decided to post my Sock Monkey hat pattern. I've used other patterns to make these hats and they all turned out great. However, this time I decided to make this hat with a totally new pattern. I like my own little shortcuts and ways of doing things. I forgot to get the gauge before I mailed it out, but I did crochet a little tightly. If you crochet more loosely, the hat will fit an adult. Rnd 3: Ch 2. Hdc in same st, hdc in next st. (2 hdc in next st, hdc in next st) around. Join with sl st. (24 hdc). Rnd 4: Ch 2, hdc in same st, hdc in next 2 sts. (2 hdc in next st, hdc in next 2 sts) around. Join with sl st. (32 hdc). Rnd 5: Ch 2, hdc in same st, hdc in next 3 sts. (2 hdc in next st, hdc in next 3 sts) around. Join. (40 hdc). Rnd 6: Ch 2, hdc in same st, hdc in next 4 sts. (2 hdc in next st, hdc in next 4 sts) around. Rnd 7: Ch 2, hdc in same st, hdc in next 5 sts. (2 hdc in next st, hdc in next 5 sts) around. Join. Finish off. (56 sts). Rnd 8: Using the red, attach with sl st and ch 2. Hdc in next st and each st around. Finish off. Rnd 9: Using the camel, attach with sl st and ch 2. Hdc in next st and each st around. Join with sl st.
Rnds 10-17: Ch 2, hdc in each st around, join with sl st. Do not finish off. Repeat this method of decreases until you end with one stitch, finish off. Holding the hat with the right side facing skip 17 sts from the first row of the earflap just made. Attach with sl st and ch 1. Sc in same st and in the next 10 sts, turn. (11 sc). Work this earflap the same as the first, but do not finish off when you finish the last row. You will work a sc round all the way around the hat. Evenly place 11 sc in the sides of each earflap and 3 sc in each corner. Finish off. Rnd 1: Sc in 2nd ch from hook, sc in next 11 ch, 3 sc in last ch. Working in the other side of chain, sc in next 11 ch. 2sc in the last ch. Do not join. Rnd 2: 2 sc in the first st, sc in the next 11, 2 sc in each of the next 3 sts. sc in next 12 sts. 2 sc in next st, do not join. Rnd 3: 2 sc in first st, sc in next 14 sts. 2 sc in next 3 sts, sc in next 14 sts. 2 sc in next sts, sc in last st.
Make a pom pom and sew onto the top of the hat. Using photos for reference, sew the eyes and mouth onto the hat. When sewing, only sew through the top layer of the stitches on the hat so the back will look nice and neat. As always, you can leave me a comment or send me a message if you need help. I wrote this up pretty fast so there may be mistakes. I hope not, but feel free to let me know. I check messages a couple times each day. Thanks for the pattern! So cute! This is great - thanks for sharing. Adorable (both the hat and child)! What a cute little monkey model--LOL. I think a life filled with crochet is just right Liz! 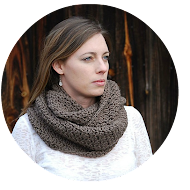 Thanks so much for sharing another great pattern. Fantastic Pattern, thanks for the share! You are awesome posting this pattern for all of us crochet hat monkey wannabe makers. I have a totally boring life, wow I got excited because I actually got the mold and mildew off my front porch and walkway yesterday. Pathetic I know. That is not pathetic:D I know what you mean about getting excited over finishing housework. I get excited when I finish my laundry early on Saturday...that leaves more time for play and crochet. That is such a cute hat! Ps. I got my hat! Thank you so much! I blogged about it today. Adorable (the hat AND model). TFS! Have been looking for a sock monkey pattern for awhile now. Found you through Pinterest. Thanks so much for sharing your pattern with us. Any chance you would do a video tutorial?! I have the hardest time making a hat fit somebody! :) I must just crochet really, really tightly! I made this one the way you said..took it to church to try it on a kid and it was snug on a 5 yr old. :) But when I keep increasing my needle size, then the hat seems too "holey" know what I mean? I saw the one link on your blog about sizing, but I'm not sure how to translate that into crochet stitches! :) Any suggestions. I know what you mean about sizing. You can follow a pattern to the tee and still come up too large or too small. I have paid for hat patterns that were way off of my gauge. All of our gauges are different so it is hard to say about the number of stitches. I would focus on the size. I usually get my tape measure and make a hat by measuring as I go...width and length. I'm sorry that I couldn't help with number of stitches...but measuring is the best way. I can't believe it's been over 4 months since I first found your patterns! :) I've made 3 hello kitty hats and am working on my 4th monkey hat. I have the hardest time getting the monkey ears on straight and centered. They are either too far back on the head, too high, too low! Etc. Any hints to get them on good?! And when I sew them on, they are so hard to remove w/o hurting the main hat part! Thank you so much for sharing your patterns. My daughter in law pinned this one on Pinterest with a note: "your grandson neeeeeeeds this!" :-) As they just moved to Alaska from Georgia, I now can't resist makeing it for him! Thanks again, it's adorable! I am new to crochet... very new! and im trying to make this for a newborn? how much should reduce? or is there another pattern i should use? You're welcome. For the ear you will hold two strands together when crocheting. This makes the ear stiffer and hold its shape. Hope this helps. oh ok, I was thinking I had to crochet around the 2 strands or something. You should get close to the right size, but I can't say for sure. You should just use the chart to get the right size. It's the best way, since we all crochet differently. I crochet a little tighter than normal. It's just hard to guess. I suggest using the chart. That way you can either leave it one stranded or double it. You would just use measurements. I've added the link to the post. I hope it helps. Thank You!! I just made this for my son's Halloween costume. He loves it!!! Your instructions were great and easy to follow. Thanks again!!! I can't wait to try this!!! I've never made hats before but have been dying to try them!! This will be my first adventure. How did you attach the braids? I am an experienced crocheter, but I just can't figure out how to attach them. Ok...I figured it out! I pulled the strands through the middle single crochet. 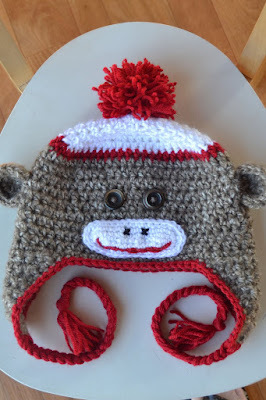 I have seen a lot of sock monkey hat patterns, but this is by far the cutest one! Thank you much for the pattern. Absolutely, enjoyed this one was fun and simple. Loved the way it turned out. I tried to find the tutorial for the 'chunky hat' for the instructions on finishing this darling hat, but can not find it. Can anyone give the link, or send me the instructions? I would really appreciate it! Thanks. Just found your pattern and I'm so excited to start it. It's darling and is perfect for my little grandson. Thanks for sharing! Love it! I love this pattern, but I need to make a hat for a 15 month old baby. Do you know adjustments for different sizes? I love the pattern!I will make one for my daughter! The model is so pretty too! Thanks for sharing this pattern. I will make one for my boy. Muchas gracias!!! Would you happen to have a loom knit pattern for this hat? I got the main part of the hat done on the loom but I'm stuck at the ears and the mouth nose piece...can this be done on the loom?